What do these two pictures have in common? The short answer is Dennis Dugan. I met Dennis through a modeling forum. I was having a problem with a modeling tool and he suggested he make it for me. Well I took him up on his offer and not only wound up with “the” tool I needed but a set of tools. 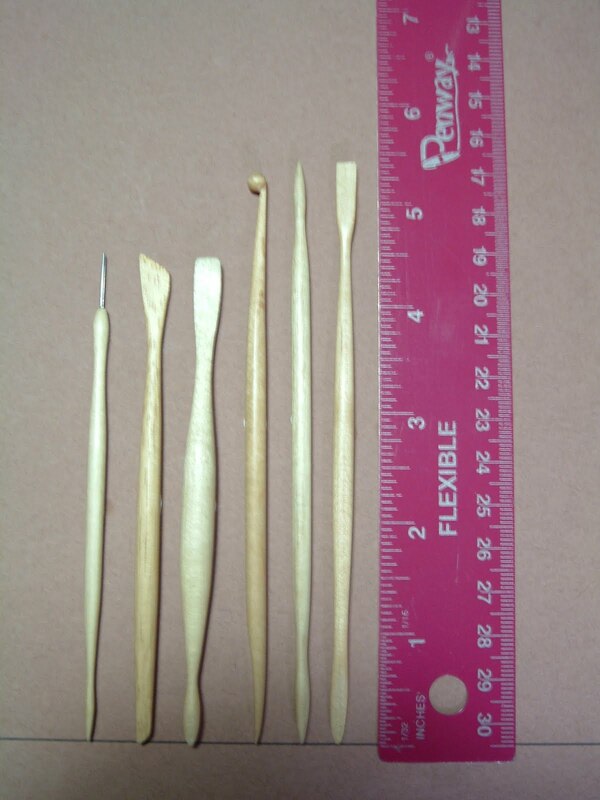 Not just a set of tools, but with some measurements he made a set of tools customized for my hands. I have small hands. The more we chatted about my needs, the more I learned about the man and the creative process, and so I am here to share him with you. Dennis Dugan was born in a small farm community, a boomer like most of us, finished high school, and did his tours in Vietnam as an Army helicopter pilot. After the Army, he worked for Shell Oil and retired in 1993. Dennis’ father was a machinist for The Atomic Energy Commission. “I learned to machine metals through osmosis practically. Acquiring and excelling at those skills led me to woodworking. I like working with my hands.” “I went to a dollhouse club meeting where I was living in Illinois. They were making some little chairs that night and that piqued my curiosity. I thought it was neat and thought I could make a better chair.” He bought in a new chair next time they met and showed it to them. “Where’d you get that?” they asked. There was a look of surprise on their faces as he explained that he made it. There is where his story of miniatures began. After making the chairs for the club, dollhouse shows, and events where he continued to sell, but he says he was not a “huge success”. This was during the burgeoning period of miniatures with Nutshell News and other magazines making their debut. Dennis wanted to make a living with his miniatures and continued to bring his talents to bear by joining his skills to create his work and works of art. Later, Dennis registered for a doll sculpting class with Jack Johnston. He thought the class fascinating and shared his work with Mr. Johnston. Dennis brought a one-fourth life-size secretary made of black walnut and beveled glass to show. Jack and the students fell in love with it. 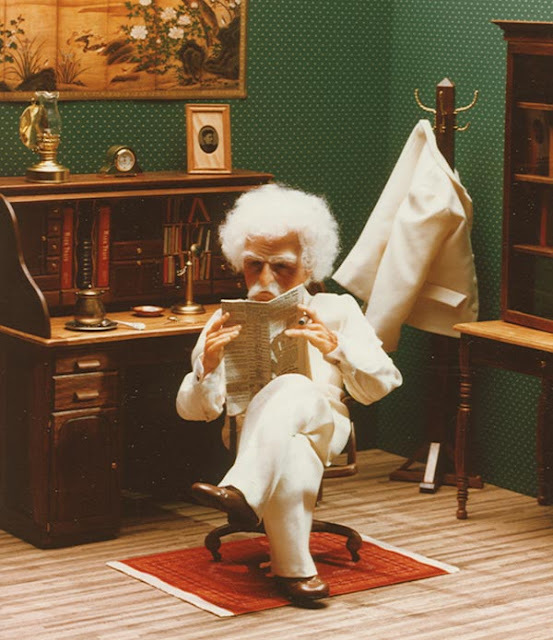 “Later I was commissioned to make a roll top desk and a bankers chair for a Mark Twain Doll.” (Now in the collection of the Sudbury Museum in Baton Rouge, LA) Dennis continued to make things for his own amusement. 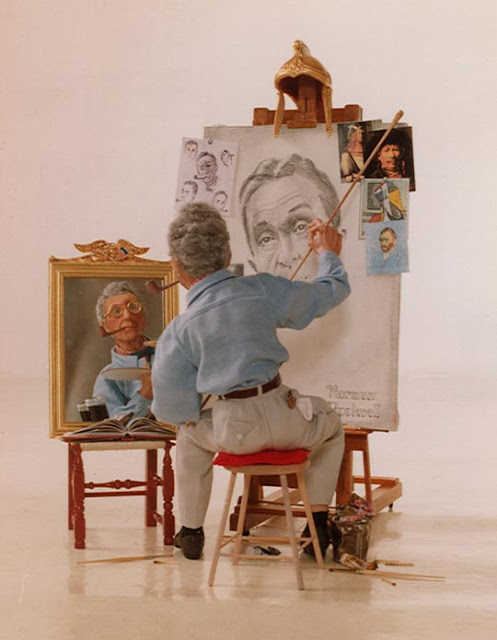 Mr. Johnston called again to commission a wooden stool, painting easel, nice spindled chair for his Norman Rockwell self-portrait. When in Florida taking a class on marketing and crafts as a business, he met Patricia Rose. (www.patriciarosestudios.com) Patricia commissioned him as well. 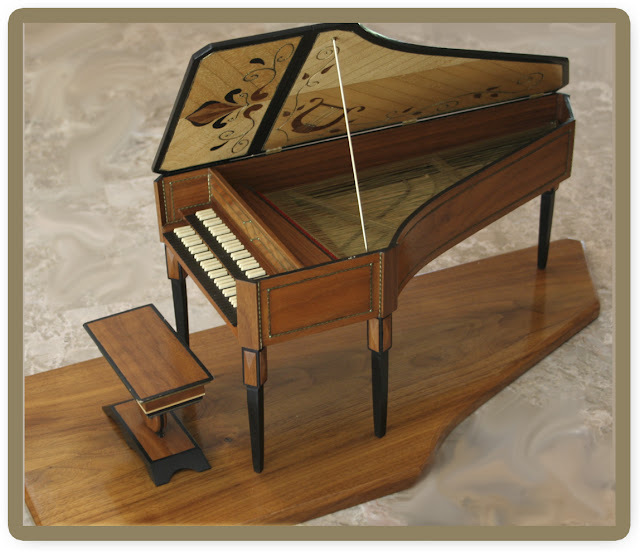 One of his favorite pieces is a Harpsichord he made for Patricia. It was not a working harpsichord, but it was realistic. Dennis has been working in wood and accessories, and brassware for dolls and whatever anyone would want. Visit his website and see his beautiful chairs and settees. He can make anything, it seems. 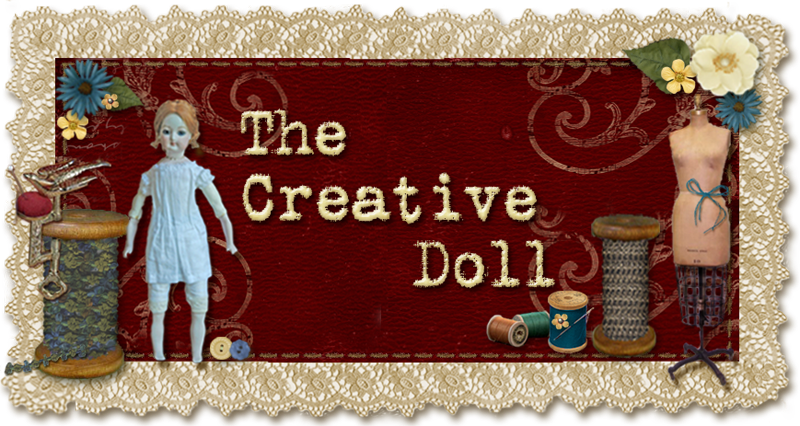 And if you don’t see a doll sitting in one of those chairs for reference, don’t worry, with a measurement or two and a conversation, even a picture, he can customize the object specific to your doll or art figure and its height. Whether you are working in 1/12th scale or 1/6th life-sized, you will get a product you will love. Visit Dennis at his website, email him, or just give him a call with your needs. He is ready to customize furniture just for you and your doll.